Thursday was the day, if you lived in Harlesden (which I do not). 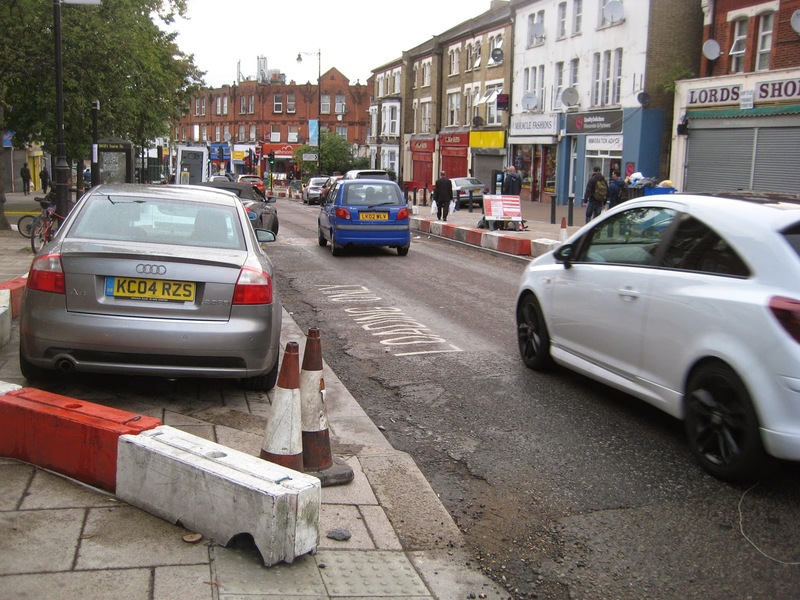 It was the day the Harlesden Town Centre regeneration scheme, four years in the planning, more years than that in the discussion, came to some sort of conclusion, with the new traffic system being 'switched on'. However, a final element of the new street design, the partially pedestrianised Harlesden High Street, will take another month before it opens for business. In case you don't know it, Harlesden is on the southern edge of the borough of Brent in north-west London, on the boundary between Inner and Outer London, but only three miles from the West End. It is highly multicultural, residential, but on the edge of large industrial areas, rather scruffy, and mostly notable for having a major rail interchange, Willesden Junction, which, curiously, is not in Willesden, but Harlesden. This area has always been a blockage to cycling, consisting of a large gyratory system that interrupts the continuity of the A404 Harrow Road, which is a major cycling desire line, as it has, further west, really the only safely cycleable crossing of the North Circular Road for miles. As a cyclist the gyratory tends to push you a long way off your desire line and mix you with a lot of lorries and buses in constricted spaces. It is also an area where the streets all crazily seem to lead off in directions different to what you expect initially, if you are not very familiar with it, as if the road grid got knotted up by unknown geological processes at some time in the distant past. The impenetrability of the area is increased by the severance caused by the extensive railway wastelands attached to the West Coast Main line just to the south, and the Grand Union Canal corridor. Harlesden High Street is part of this hard-to-comprehend gyratory system, and has always been a merry, chaotic, somewhat down-at-heel mess. A great play has been made of the new street layout and design having been selected by, or designed by, the local residents and businesses, in the form of the Harlesden Town Team. A study of the area was commissioned by Brent Council and Transport for London in 2010, produced glossily by a firm called Urban Design Skills, on behalf of the council and the Town Team. I have it here. It is signed (in print) by all the members of the Harlesden Town Team, and contains the usual consultants' guff about 'vision', 'renaissance', 'pillars', 'themes' , 'gateways', 'public realm project areas', etc. I am not sure how much it all cost, but I recall a figure of £2 million just for the studies and preparatory work, from a previous Brent Local Implementation Plan. And, the result of all this is they are replacing a confusing gyratory system whose design never made any concession to those who wish to travel by bike with... another one. With semi 'shared space' style paving in places. And lots of bollards. And narrower carriageways, that will either squash cyclists into the gutter, with dangerous overtakes by wide, heavy vehicles, cause intimidation if cyclists decide to 'take the lane', or block their progress entirely if traffic is queued up, and force them on to the pavements. 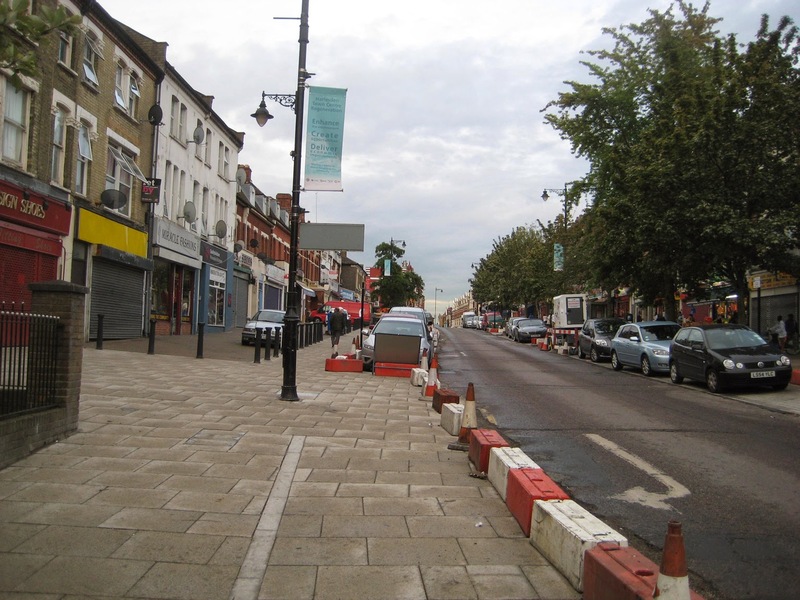 The 'star feature' of the Harlesden scheme is the partial pedestrianisation of the High Street, with no motor vehicles allowed except for loading and buses. Cycles will be allowed, but they will not be excepted from the one-way used by the buses. So north-west bound cyclists will be able to cycle in a relatively traffic-free environment, briefly, on the High Street, before joining the merry rat-run between rows of parked cars in Craven Park Road. Going the other way, they will have to throw themselves round the gyratory system, via again narrow corridors parked-up on both sides, which I expect to have just as much of a hostile rat-run character as they do now, full of buses and heavy goods vehicles. There are no exceptions to the one-ways for cyclists in this new system, and there are also numerous minor streets off the main roads, not shown in this diagram, that are one-way. I expect there to be widespread infringement of the design by cyclists, for their own safety: either going the wrong way down one-way streets, or cycling on the pavements. The changes from the previous gyratory system are that while the whole of Manor Park Road was one-way before, now only the part north of Tavistock Road (the leftmost of the two one-way cross streets in the diagram above) is, and while the whole of Harlesden High Street was one-way, now only the semi-predestiranised section is. The semi-predestrianisation may be viewed as A Good Thing for pedestrians, but why wan't it continued further north into Craven Park Road, to the junction with Manor Park Road? This would have made sense, as it is all a continuation of the shopping centre. The answer is that this wider section was wanted to accommodate parked cars on both sides, so couldn't be pedestrianised. Hence the gyratory had to be pushed on to Tavistock Road feed cars into the Craven Park Road shopping area. But note this town centre already has a huge off-street car park – you can see it in the aerial view in the angle of Manor Park Road and Tavistock Road. So clearly a principal driver in the redesign was the maximisation of car parking, and the idea that this has to be right outside shops. This is, of course, a consequence of the faulty idea that shopkeepers often have, that their trade comes mostly by car, when in a place like Harlesden, it does not, it comes predominantly by foot, bike and public transport. But those customers, the majority, are not encouraged by dangerous, unpleasant and polluted car-centric environment. This is one reason why centres like this are failing. I took some photos of the nearly-completed streetscape of Craven Park Road, effectively the wider, northern part of the High Street, in August. The scheme is not finished in these photos, but you can see where the kerb lines will be, the general style of it, and also the very large amount of car parking built into the streetscape. I fear the pious hopes of a renaissance of this town centre on the back of this rebuild will come to very little. The system overall certainly does not create a set of streets where parents would be happy allowing their children to cycle. It seems that such a possibility never entered the heads of those designing it. For the Harlesden Town Centre scheme in the light of today looks like an astonishingly regressive piece of urban planning. With the Mayor of London proposing wide, segregated cycle tracks on main roads in central London, and the neighbouring Borough of Camden putting in cycling exceptions to most of its minor one-way streets, or building contraflow and with-flow semi-segregated tracks to keep cyclists safe on its gyratory systems, here we have a massive, expensive rebuild of a town centre only a couple of miles west that focuses on providing space to park cars, provides unnecessary wide pavements that will themselves almost certainly get parked on as well (because of the low kerbs), and makes no concession to transport cycling on a major commuting desire line except for a few token advanced stop lines at junctions. I don't blame the members of the Harlesden Town Team for this. They are no doubt good people within their fields of expertise, but they are not urban planners or traffic engineers, let alone experts in sustainable transport. Not having been involved in the process myself, I can only surmise that what happened was that they were given various options by Brent's planners, or by the consultants, all of which would have been rubbish for cycling, and they just chose one. Which we have now got. Andrew Gilligan, the Mayor's Cycling Commissioner, did keep warning us, after the launch of The Mayor's Cycling Vision in March 2013, that there would be lots of old-style traffic schemes continuing to come through the planning system on London's main roads, and continuing to get built, even though they were completely inimical to the Cycling Vision. He said he couldn't prevent that, that it takes a long time to turn a supertanker around. One of those schemes was clearly this one. I criticised the Borough of Camden, in previous posts, for their West End Project, still under discussion, in which they have been seeking to undo a gyratory system (Tottenham Court Road, Gower Street and Bloomsbury Street) merely because it is fashionable to think that doing so will somehow make the streets automatically better for walking and cycling, but without putting in first-class cycling provision, which I thought the Cycling Vision had promised us on these streets. However, perhaps Brent deserves even more criticism for not following fashion, in this case, and leaving a bad old gyratory system almost perfectly intact, after spending a great deal of TfL's money on it, perpetuating dangerous, parking-sodden streets, which will not encourage people to shop here, providing zero meaningful cycle facilities, and, to top it off, creating the farcical situation of one-way cycling in a near-pedestrianised high street. It's just clueless – as if the the exhaust fumes in the air of Brent prevent people from imagining any different way of arranging things. What I think they should have done in Harlesden is actually rather on the lines of what Camden are proposing for their West End gyratory (and for which, paradoxically, I have criticised Camden). They should have made the whole of Manor Park Road two-way, and put all the general traffic on the A404 corridor down that, reducing the parking to one side to make it wide enough for the job. Then Harlesden High Street (from the Jubilee Clock junction northwards) and Craven Park Road (to the junction with Manor Park Road) could have been the two-way bus and cycle route (allowing deliveries also at certain times) with wide pavements, done in a fully shared-space style. Alternatively there could have been cycle lanes on the wider parts of Craven Park Road, but this is not Tottenham Court Road, the concentration of buses is far lower, and I think a shared space street, without cars, would have been fine, and it would have looked far nicer, and have been a far more pleasant and safe environment than what we are going to get. This could have formed a 'ready-made' section of a Cycle Superhighway along the A404, so badly needed with the complete neglect of north-west London by the Superhighways programme so far. 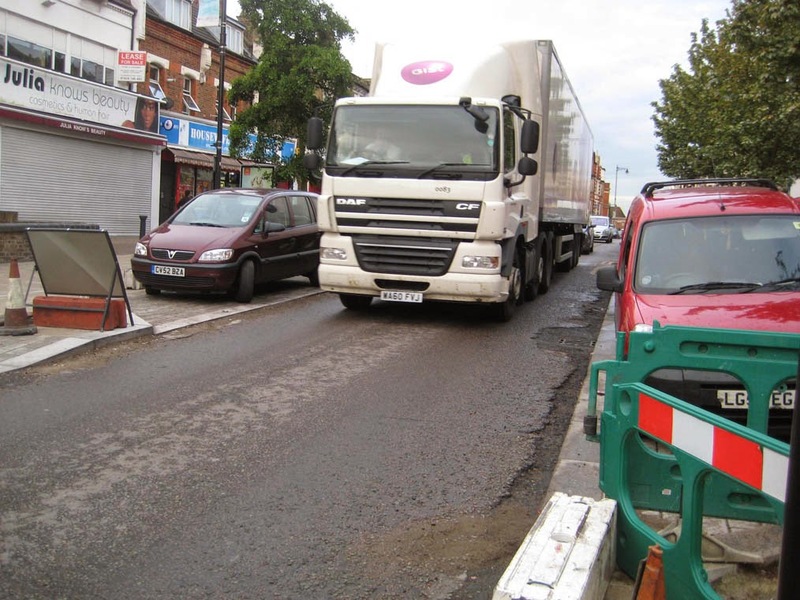 For sooner or later we are going to need the A404 Harrow Road converted into a decent cycling highway, and all this work that has been done will have to be changed again. "What are you taking photos of?" "Because I am interested in street design." "This is the worst designed street in London"
"Do you think it will be better or worse after these changes?" "Much worse. They should have left it how it was." I think they should not have left it how it was. They were right to try and change it. But, in the end, streets should be redesigned by people who know what they are doing, and who genuinely take the needs of pedestrians, cyclists, and bus passengers into account, in that order, as well as the need for a flow of general through traffic on a main artery, and the need for some car parking. The dangers with the "DIY streets" idea (hyper-local consultation and decision-making) are that groups can get excluded (as in this case cyclists clearly were), and that more strategic interests bearing on local streets are not taken into account (for example their place on the city-wide cycle network). In any case, the results can only be as good as the expert advice being given to the community supposedly taking the decisions, and that often leaves a lot to be desired. Henry Ford once apparently said "If I'd asked people what they wanted, they'd have said faster horses". That's the problem with this type of consultation. It sounds like an expression of democracy but really it's just an expensive and time consuming route to confusion and inadequate change. Good post. I rode up there the other day to check it out. It's progress but not much. Amazing. Brent is pretty bad....but we knew that.